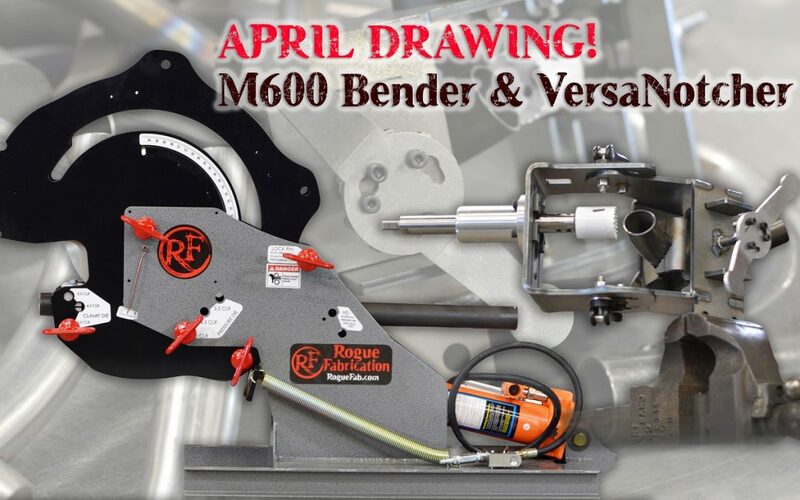 We’re giving away both an M600 Tubing Bender AND a VersaNotcher (Retail $1150)! Or $1000 in credit towards dies or a mandrel attachment if you already have these tools from us! You can enter for FREE or easily by just buying swag from us! You have GREAT odds for winning these! This isn’t like those typical social media giveaways where there are ten thousand people entering! HOW TO ENTER: Any of these 3 things gets you entered. They add up if you do more than one! 1. Buy anything in our swag category at https://www.roguefab.com/product-category/swag/ – you will get an entry for every $5 you spend, rounded up by up to 99 cents to the nearest 5 dollar increment. 2. Write a review on our company or our products. You can submit your review on Google, Facebook, or right on our web page. These add up, so you can do multiple. Reviews must contain a few sentences (minimum). Photos, videos, etc will get you additional entries. 3. You can enter by sending a postcard to: Rogue Fabrication, 42335 SE Marmot Rd Sandy OR 97055. Write “April 2019 drawing” on it. We’re shipping swag orders out SAME DAY in most cases right now! We will draw a winner live on Facebook at 8:00 AM PST on Friday, May 3rd (immediately followed at 8:10 am on Instagram). That person can chose any configuration of our M600 tubing bender that is priced at $725 (like a weld together kit with a 4.5 CLR die, and they will also get our VersaNotcher. If they want to upgrade either item, they paid the retail price difference. So if you wanted to upgrade to an NHRA package, you could just pay the retail price difference ($3099 minus $1150). If they just want store credit on dies or a mandrel attachment, the credit is $1000. Shipping IS NOT included. We do giveaways like this EVERY month. They only last about 30 days. We NEVER EVER has double-entry days or anything like that. Void where prohibited. No cash back given. No cash value. No purchase necessary to enter. Must be 18 years old to enter. Wow, got the Rogue m600 bender and versa notcher, and the projects are coming together and heading out the doors. It was very simple to put together. Makes perfect bends and has sped up production. Thanks for a great product. Bought this badass bender a while back… best investment I’ve bought for my company… certainly could use another especially with a notcher!!! The guys are as cool as their equipment, and willing to be straight up if there is any problems… come on Joe… send me another one!!! If i win i will be turning my 8.50 cage to a 25.5 cert in my 95 Acura Integra as well as be able to start doing more fab work for customers. I am building a 56 Ford Mainline which has very little aftermarket support. I want to build some tubular control arms along with a transmission crossmember and roll bar. It never ends but this would be very handy. Last time I had some chassis work done I had to wait on a 7 month waiting list. Rogue fabrication the best tools and equipment for custom fab projects. Top notch equipment made tough and durable to last years to come. This is an awesome contest! I’m hoping I win so I can continue teaching my sons how to fabricate! Roll cage in my 1957 Chevy truck and build a few other car and truck frame chassis to show off at shows.